Civil War-era Information Discs are commonly thought to be one of the oldest precursors to modern dog tags. Today, dog tags and DNA testing are used together. For the past 21 years—since Granada in 1983—not one American serviceman or woman killed in action has been listed as unidentified. (A few men have been lost at sea and one pilot from Desert Storm has been listed as MIA/POW after his wrecked aircraft was located, but not his remains.) For families, the loss of a loved one is hard enough, but they have at least one small comfort if the remains are returned. It was not always this way. In the American Civil War, 148,833 soldiers were unidentified, and of 70 sailors recovered from the wreckage of the USS Maine in 1912, all remain unidentified. At least 78,750 servicemen from World War II have never been recovered and 8,532 are interred as unidentified. The number not recovered from Korea totals 8,100 and 856 have been interred as Unknowns. From the Vietnam War, more than 1,800 still have not been recovered or identified. These are large numbers, but the reason for the decrease in the number of unknowns over the decades—and thus the success rate of identifying soldiers’ remains—owes much to the identification system put in place by the United States military. Primarily, this consists of identification tags, colloquially referred to as “dog tags”, and now supplemented by DNA testing. In fact, the Pentagon began a program for the collection of blood and oral swabs for all military personnel then on active duty and for all those entering the services. A DNA data bank was established so the United States would never have an Unknown Soldier again. The dog tags, plus the DNA data bank, work. Precursors to modern dog tags began with the Civil War. Once the soldiers of that war saw how deadly service was becoming, they went to certain lengths to identify themselves. In part this had to do with the fact that widows could not obtain pensions from the government unless they could prove their husbands had been killed. Thus, Union soldiers pinned papers to their backs before the charge at Cold Harbor in 1864. Others privately bought any number of varieties of identification tags from sutlers in the field or from New York City outlets. In addition, Corps Badges (geometric shapes) were available in gold or silver and the name and unit of the wearer could be engraved on them. 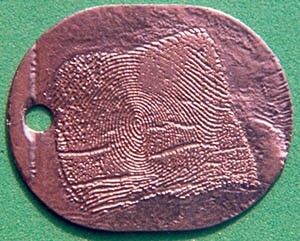 A Civil War-era Identification Disc was also available in brass or pewter with a profile of George Washington, Abraham Lincoln, or a famous general. Other styles had patriotic sayings as part of their design. The soldier’s name and unit were inscribed, and some had an area where battles could be stamped on by the unit’s sutler. The words “War of 1861” or “War of 1861 & 1862” are commonly found on both the Corps Badge and Identification Disc, thus establishing the time period. In addition, some soldiers made their own “trench art” ID markers. In 1906, the military began its first regulated system of identification. The first military-issued precursor to the dog tag was made of aluminum, 30mm in diameter, and embossed with metal hand stamps. The wooden cases that held the stamps had an instruction card attached to the lid showing how to stamp tags uniformly. The information placed on the tags included name, rank, company and unit, and the letters U.S.A. Their neat, uniform stamping style makes these century-old military tags easy to identify. In 1910, a new military tag size was established. No formal regulation for this change has been found, but an instruction card attached to a 1911 stamping kit has the words “Model of 1910” written on it. The tag is the same as that of 1906, only larger, 35mm in diameter. Model 1910, or M1910, military tags were worn by American soldiers in World War I. Up until this time, one military tag—not two—was worn around the neck, but by June 1917, troops already in France received a second tag. These were 1 inch square and made of aluminum. The Model 1940, or M1940, dog tag holds the soldier’s name, service number, tetanus inoculation date, blood type, address of next of kin, and a letter noting religious preference. (For medical reasons, the Army tried to give a tetanus booster shot once a year and wanted a record of it kept up to date on the soldier’s military tags. If the man were wounded a medic could see if he needed an injection of tetanus toxiod to fight infection.) In 1943, the next-of-kin information was removed, reportedly for security reasons should a soldier be captured while fighting in Europe. This removal of next-of-kin information is one means by which a collector can date a dog tag. The tetanus date was also a great help until it also was removed in the mid-1950s—although it is worth noting that examples with tetanus dates into the early 1960s can be found. The oval Monel dog tag used by the Navy in 1917 was still in use during World War II, not only by the Navy but also by the Marine Corps and the Coast Guard. Information was placed in three ways: all acid etched, stamped information with an acid-etched fingerprint, or all stamped. By 1955, every branch of the armed forces was using the M1940-style dog tag, noting branch of service by the letters USN, USMC, USCG, or AF. In 1967 a new non-notch dog tag style emerged. It was worn by servicemen in Vietnam and is the style used today by soldiers in Iraq. The various branches still identify themselves as they have since 1955, but two changes cropped up in the Vietnam era. From 1969 to 1973, all services replaced the service number with the Social Security Number, and the blood group RH factor was added to the blood type for rendering better medical care if the wearer were wounded. Tags Abraham Lincoln, american civil war, armed forces, civil war, Desert Storm, Dog Tags, Europe, France, George Washington, Granada, Military IDs, Soldier IDs, United States Marine Corps, Vietnam War, World War I.